It's not often that you can go to a beer festival, and not have a single bad beer. But that's what I got at Saturday's Cellarfest at Bailey's Taproom: quite a few delicious big beers, and of the dozen that I tasted, not a single dud. I mean, when the beers that grabbed me the least were 2008 versions of Rogue Glen and Lucky Lab Pavlov's Imperial Stout, then it's a very good day, because those were two really solid beers. The other thing that was remarkable about the Cellarfest was how few of the usual beer suspects I ran into at Bailey's. I really like the usual suspects, but it's a very good sign of the breadth of beer appreciation in Portland that the place was packed with more than just the usuals, and really without much publicity for the event. Granted, I was only there from about 4:30 to 6:30, apparently after professionals like the Brewpublic and portlandbeer.org posses had come and gone. My friends Brian, Bryce, and Cathy had snagged a relatively quiet spot in the back of the bar, so Lindsey and I took it over when they moseyed along; maybe we would have jostled more old acquaintances in the front of the house. Anyway, about the beer. Bailey's has only been open for a couple of years, how deep can their cellar be? 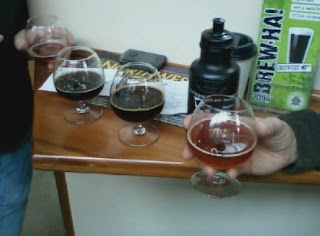 In fact, most of the beers on tap -- 10 of 17 -- were from 2008 and 2009. That's OK by me -- occasionally a beer will keep improving after two years of age, but for the most part two years is enough time, and you get more and more blemishes as the years go by. I was too late to the Cellarfest to try two of the oldest ales: the Fish Leviathan from 2004 and the Terminal Gravity 2006 Bucolic Plague. But the 2006 Alaskan Smoked Porter proved my point: still a fine beer, but the papery flavor of oxidation was starting to become a distraction. Here are some short notes on the beers I tried, more or less in the order of preference, though it's almost as hard to say what my favorites were as it is to say what my least favorites were. Everything was nice. Before there was Abyss... there was Caldera Imperial Stout. Whenever you see it on tap, drink as much of it as you can. A couple of suggestions for Geoff for next year's Cellarfest. First, it would have been nice to have the styles of each beer listed on the beer list handouts. Second, alphabetical order is a beer-drinker's friend. But don't get me wrong, this event was wonderful as it was, from the well-chosen beers, to the sweet souvenir snifter, to the speedy service despite the big crowd. Sad to say, but you're the only blogger to do a write up on the event. Derek wrote a nice intro. Keep up the, uh, good work? The flavor is a nice combo of the fruitiness of the Wassail combined with the density of Porter to create a nice blended brew. In that review it was a Full Sail blend. Why would I insult the readers intelligence by describing the Wassail and the Porter. I'm describing the blend of the two beers. The nuances of the fruitiness in the Wassail beer to the density of the porter. I guess I could have used more descriptors to describe the beer. I 'AM" definitely capable of evaluating a beer. ;-} I was assuming the reader knew what the original beers taste like. I made a short cut. Through the blog grapevine, I had heard this beer was not very good. I have to disagree. For my palate this was pretty much a nice infusion of Full Sails Wassail and the Bourbon Barrel Porter. The aroma was of dark malts, chocolate, treacle, toast and then the whiskey oak came through. Nice. The flavor is a nice combo of the fruitiness of the Wassail combined with the density of Porter to create a nice blended brew. It tasted like what it promised!!! The vanilla flavors from the whiskey oak cask comes through and combines nicely with the Porterish concoction. I seem to read more than just "Nice" & "Fruitiness"! Pub Night - sorry I missed you @ Cellar Fest. Dr. Wort - why must a blogger use a plethora of descriptives in their writings? I've been known to simply write - "not a fan," usually while describing Belgians. Blog on my friends! Blog on! ASG: That's too bad, we should try to intersect at some beer happening or another. Are you on twitter like the rest of the Portland beer gang?